It's that time of year when we're all trying to get back on track~ new year, fresh start to our healthy eating habits. However... it's also almost time for football playoffs, which means greasy game-day snacks to throw you off. Whether you're headed out to a Super Bowl party, or entertaining at home~this guacamole is the perfect dip to keep you feeling satisfied, without breaking your diet goals. It's super fresh & flavorful, and an easy crowd-pleaser! I mixed up a large batch of this guac for me & my boyfriend to snack on during our New Year's traditions... staying up for the ball drop at midnight, & watching the Rose Bowl on New Year's Day. It was the perfect snack & we both couldn't stop eating it! Skip the pasty green store-bought stuff, & make your own at home. All you need are some utensils & a few fresh ingredients! 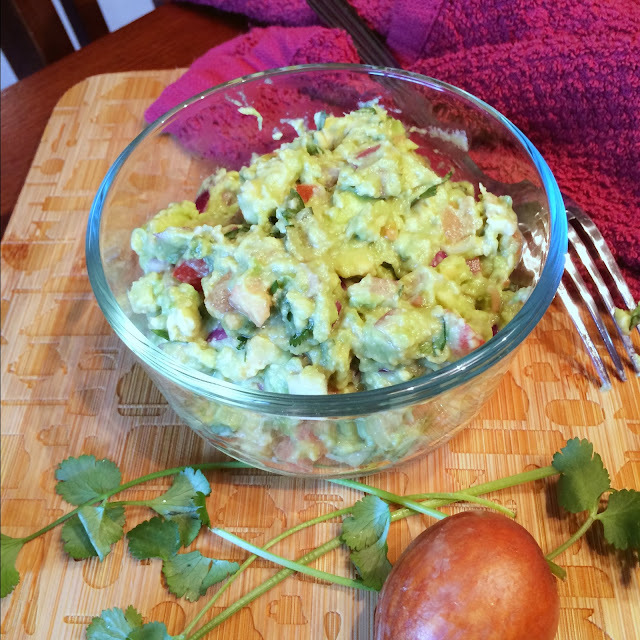 & Don't forget to save an avocado pit or two~ they help your guacamole stay fresh & keep it from turning brown. Just stick them in the middle of your prepared guacamole until you're ready to serve! Try this served with sliced vegetables (red bell pepper, carrots) for a healthier twist, or go for some gluten-free corn tortilla chips. Guacamole is a great condiment too~ try it on top of your burger or salad! *Feel free to cut the recipe in half if you're only serving a few people. 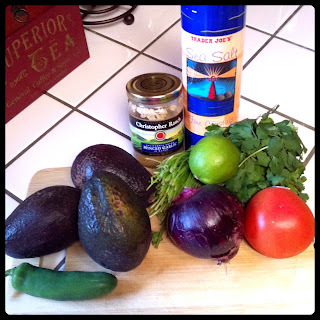 In a medium bowl, use a fork to mash the avocado with garlic, lime juice, and salt. Mix in the tomato, onion, jalapeño, and cilantro until combined. Cover & let set in the fridge for about 1 hour (for best flavor), & enjoy! We make a similar recipe often in a molcajete which is a cool lava stone grinding bowl you see in mexican restaurants. Try the Lundberg rice chips also instead of tortilla chips, which are non GMO and USDA organic and delicious. Where do you find the Lundberg rice chips? I will have to try them!